Google+ is a new and innovative social web service that revolutionized the way we communicate and share information with our friends. With many features that distinguish this service from other competitors, Google+ has managed to form a strong society of people who enjoy more power in managing their friendliest with Circles, and the ability to instantly share their webcam chat sessions with all of their friends, family, co-workers and others. New social network from Google! One of the largest social networks in the world Google+ (sometimes written as Google Plus) comes from none other than creator of the famous Google search engine. Created to enable everyone to take full advantage from all the Google’s innovative cloud services, discover new internet content with ease, and communicate with your friends, family, co-workers and others, Google+ represents one of the most easy-to-use and feature-full social network apps you can find today. Officially released into the public in 2011, this state of the art social networking and identity service has managed to attract over 500 million users worldwide represents one of the fastest growing communication hubs on the modern internet. Don’t think that this is just another competitor of Facebook. Even thogh social interaction and internet content discovery lays at the foundations of both products, Google+ manages to distinguish itself by being completely integrated into large array of services and tools that are part of today’s modern Google offering. With it you can gather stream of internet news, see real-time updates on the comments you friends, family, co-workers and others have made, and direct access wealth of multimedia no matter if you are accessing Google+ on your PC, Mac, tablet or smartphone. In addition to access to wide array of Google Apps, one of the most famous features of Google+ is Hangouts, incredibly streamlined webapp for video chat in which you can invite up to 10 people to participate in, and even stream your conversation directly to YouTube as a live stream that can be viewed by everyone! 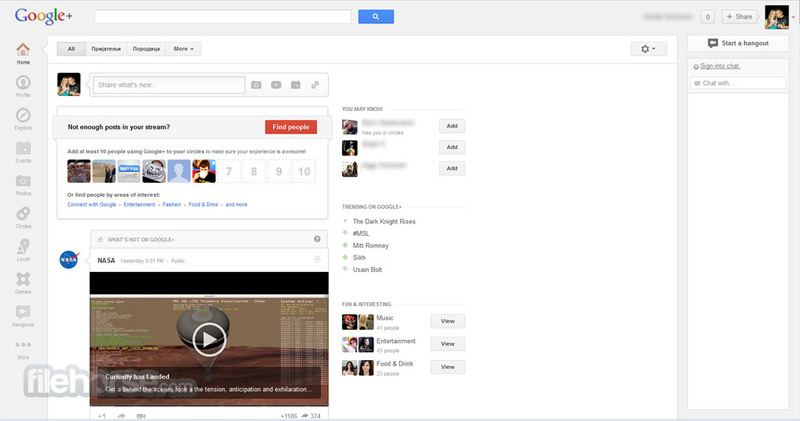 Basic interface of Google+ can remind you of the one of Facebook, but similarities quickly start fading after that. To enable each user to much tightly control the way he receives news in his Google+ Stream, you can separate your friends in several circles (Friends, Family, Acquaintances, Following and Work). You can follow people and brands much like you would do with Twitter, and they can follow you and get your updates instantly. This way, you can elect what news you want to follow first, enabling much more elegant way of removing “pollution” of non-relevant data when you are willing just to see what is new. You can fully control your Circles, making them public or private, which is not present in many modern social network sites of today. 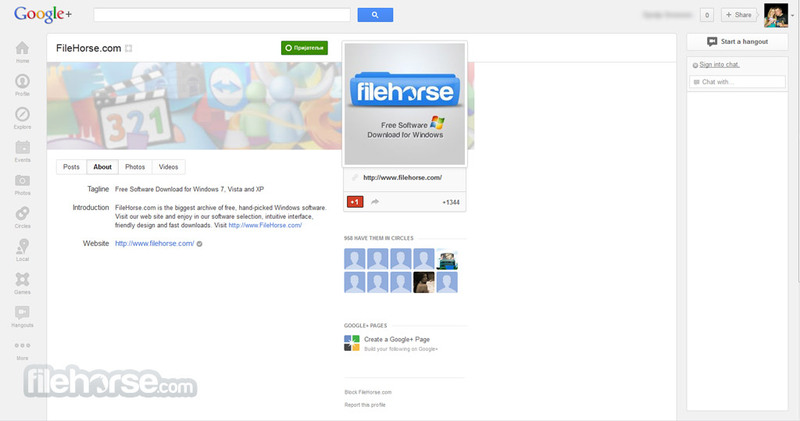 Google+ is completely free service that can be used by anyone who has Google Account. Simply create Google account if you don’t have one, and you will be fully ready to start exploring the internet and contacting your friends from no matter what device you are using. New social network from Google! 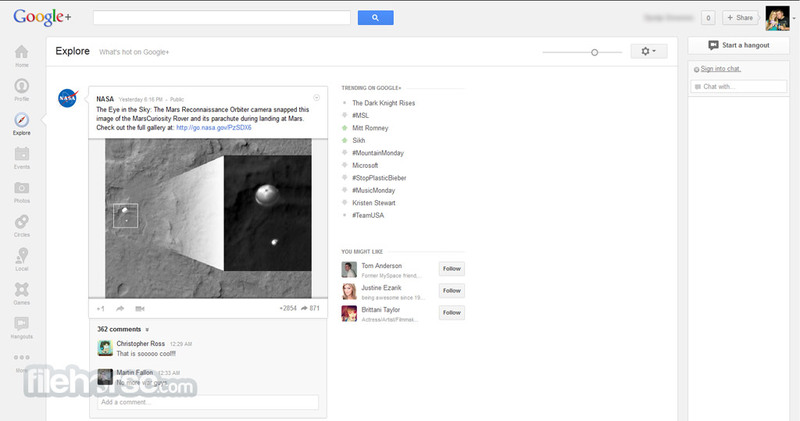 Google+ is a interesting mix of Twitter and Facebook that takes full advantage of other web offerings from Google. If you are already heavily invested into Google ecosystem with the products such as YouTube, Gmail, Google Drive and others, using Google+ will be natural extension of your internet experience. Whether you're using Search, Gmail, YouTube, or Maps, Google gets better when you add the stuff you're interested in and the people you care about. Just like in real life, you don't want to share everything with everyone. Circles are an easy way to share some things with close friends, others with your family, and almost nothing with your boss. Be together, even when you're not together. Jokes get funnier, news gets bigger and surprises get more surprising when you're catching up in person. New social network from Google! Use Instant Upload to automatically save every photo you take with your phone to a private album on Google+. Then share your favorites with just the right people, and store the rest for free. Never lose a memory with Google+. Join a hangout, post a photo, or see what friends are sharing while you're on the go. And use Messenger to get everyone on the same page with fast, simple group chat.